A few days ago, Australian Hunting Podcast shared this story on how a small group of federal politicians formed a group called Parliamentary Friends of Gun Control. The group (with probably just the two members) was formed to back John Howard’s gun laws – but if you read through the story, you would have seen who was behind it. 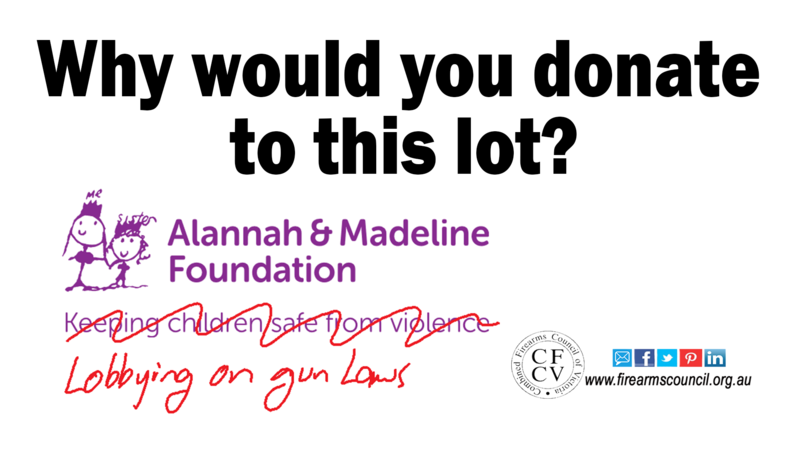 The group was the idea of the Alannah & Madeline Foundation, the charity established by Walter Mikac to honour his daughters, aged six and three, who were among the 35 people killed by Martin Bryant at Port Arthur in 1996. A letter to all MPs and senators sent on Thursday noted that 80 per cent of Australians support strong gun laws and debate should be “informed by evidence and facts”. Yes, evidence and facts would be good. They would in fact show why the AMF, while formed for a good reason on the back of a real tragedy, is seriously misguided. Yet it spends its time running petitions on our lever-actions and writing to politicians on gun laws, which has nothing to do with caring for children. It is acting in the same way as Gun Control Australia. Why it has strayed so far from it’s original purpose, we do not know. You have to wonder what role the Herald Sun, which has a direct link to the AMF, and John Howard have played in this unfortunate hijacking of the charity. Backers of the AMF should ask why the AMF has strayed from it’s objectives. Either that, or demand it rewrites its objectives to ensure they more accurately reflect what the organisation actually does. It’s an income generator for them. Generate fear. Spread misinformation. Get politicians nodding and appearing in the media…then rake in the dollars from donations. Just a tax free scam. Vote the pollies who back this crap out and let them know your displeasure , walter mikac is was a coward , hiding while his wife and kids where being murdered by a mad man. Well, I’m not about to support what Walter is doing no, but he was in a bad situation back in ’96, so I wouldn’t quite put it that way – but your point about voting pollies out is spot on. The Foundation should lose it’s tax exemption for not sticking to it’s original charter. The pollies who support them should be voted out, quickly! Perhaps licensed firearm owners should start a campaign against not for profit Organisations and insist they pay tacx on donations not utilised for their original purpose. They tried to get me to donate at the Royal Melb Show. I made it quite clear they will no longer get me to donate now the have become and anti gun lobby group. Definitely strayed from a good cause. You guys are legitimately twisted aren’t you. Do you actually hear yourselves? Bemoaning how dead children might impact negatively on your hobby. Grow up. Hi Paul. Thanks for your reply. Yes, we hear ourselves. As we said, the Foundation has unequivocably morphed into a anti-gun group. It’s not about what it was originally meant to be – the Starry Starry Night, that kind of thing.